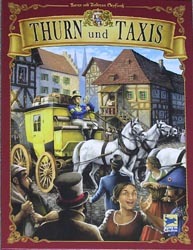 I’m a bit late posting this but the German game of the year (family variety) turns out to be Thurn und Taxis, designed by Karen & Andreas Seyfarth and published by Hans-im-Gluck. Congratulations to all concerned. Next up is the Deutsche Spiel Preis, the voting for which ends on 31st July. Caylus is probably the game I expect to win … and I wouldn’t be unhappy with that decision, but Shadows OverÂ Camelot may stand a chance based on its Meeples Choice showing. The next UK game convention is taking place this weekend. ManorCon XXIV will be held on 21st to 24th July 2006, in Shackleton Hall, Birmingham University, Birmingham. Manorcon is the largest UK convention and has plenty of organised events. Tournaments willÂ include: Diplomacy, Settlers of Catan, 18XX, Outpost, Acquire, Puerto Rico, St Petersburg and Croquet. There will also be plenty of non-tournament games on offer â€“ far too numerous to mention! Other events will include the a games stall, a pop quiz and a treasure hunt. I wasn’t at this week’s session but Steve kindly sent me a report. 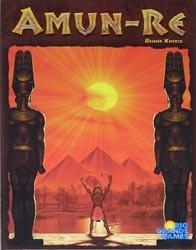 The first game was Amun-re. The game is split into two scoring rounds and both myself and Mark G where floundering as to what was the best strategy, we consequently scored a very lowly 6 and 5 respectively, having not picked up any bonus scoring cards, together with very suspect postioning on the board. Phil (who hadn’t played before) took the lead at the half-way point with 16 with Nige on 13 and Mark K slightly further back on 11, but with a huge amount of money. In the second half me and Mark G came back with a vengeance, I scored 25 and Mark 24 (the two highest scores of the second round) to take our scores to 31 and 29. Phil managed 21 to take his score to 37 and Nige and Mark K took their scores to 32 and 29. Me and Mark G in the auctions had both played for areas that would take advantage of bonus scoring cards and other scoring opportunities (something lacking in our play in the first half of the game) The other three struggled to pick up bonus power cards and their second half scores reflected this. Phil looked good for the win, but there was still the question of points for the three richest players. Mark K was still very rich and took the 6pts, I managed 4pts for second highest and Nige got the 2pts for third highest. This made the overall scores Phil 37, me and Mark K on 35, Nige on 34 and Mark G on 29. Mark G had little chance of being richest as he was using a 10 gold card to secure the first place in the sacrifice phase, saying that “it was all I had” until Nige pointed out you could get change from the bank, much to everyones amusement. A very close finish in the end and a good win for Phil, although I did say it was a win for Garry as none of the closest contenders on the hall of fame had won. Next up was a quick game of Catagena, Mark K had to go so it left the four of us. Cartagena is a nice 30 minute filler that is played in the same time if played by 2 or 5 players. The game consists of playing cards with symbols on them to advance your pirate from his jail cell to the escape boat along a twisting board, but the only way to get new cards is to move your pirate backwards towards the cells. It’s a constant balance of having enough cards and getting your pirates moving in the right direction. Me and Nige were the front runners for the most part, progressing steadily up the board. Mark G had two front runners, but also four pirates who hadn’t left the cells! He suddenly realised he was in danger of getting the guys back in the cells isolated and started moving them up. Nige was the first into the boat and quickly followed this up with 3 others using what I called the ‘pistol express’ (all the pistol symbols were covered up) I had by now got 3 on the boat but still needed two more turns to win. (time I didn’t think I had) Fortunately for me Nige had run out of pistol cards and instead had to move his remaining two pirates with other cards one of which was a skull symbol. Luckily I had 3 skull cards and was able to put my remaining three pirates straight onto the boat in one turn for the win. This week, we decided to have a go at Warhamster Rally, although Nige wasnâ€™t keen when I described as a cousin to RoboRally. Itâ€™s not quite as brain-burning as RoboRally though as you are only programming one move ahead rather than a series of moves. 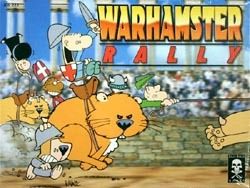 Players try to race their Warhamsters down one side of a course, round a marker post (actually a Battle Budgie) and back to the finish line also marked by a Battle Budgie. The space you land on determines which direction you face at the start of your next move but, of course, just like RoboRally you can end up being shoved out of the way and hence facing a different direction from the one you expected. Then there are the other creatures who can also get in your way, which can make progress rather tricky. John suffered early on and took quite a while to get even half way down the first straight. Mark K took a useful lead and was first to round the corner. Mark G shoved my Warhamster out of the way and proceeded to take a second move to go past me. Unknown to him, the shove put me in a better position and actually meant the move I had chosen earlier pushed him into a Kobold Khin space so losing him a turn. I then did my best to put obstacles in the way of Mark K and Nige came up on the rails. I made a mistake on my last turn as, had I chosen a different card, I could have crossed the finish line using my final action chip. As it was, all I could do was stare as Nige crept across the line to take the win. It took us a while to iron out some of the rule ambiguities and that slowed the game down quite a bit. I think once we were familiar with the game, it would have played much quicker and on that basis Mark K, John and I gave it reasonable ratings. Even though he won, it wasnâ€™t Nigeâ€™s type of game so he rated it pretty low. 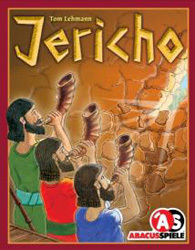 After Warhamster Rally, we just had time for a shortish card game and, as we hadnâ€™t tried Jericho before, we gave that a go. This is another one about building walls and collecting points for having the longest wall in each colour (like Kniziaâ€™s Great Wall of China that we played a few weeks ago). This time, three scoring cards are shuffled into the deck to determine when scoring takes place. A player has three choices: he can place a coloured card to start or extend a wall, place a wild wall card to remove the highest valued card in a particular colour, or put a card in the pot, these being the victory points won in each colour when scoring occurs. This means you you want to add cards to the pot in colours where you have a decent lead but then, you run the risk someone will overtake you. I quite enjoyed this. There is certainly a bit to weigh up but you are a bit at the mercy of the cards you draw. I didnâ€™t draw a wild card all game whereas John seemed to have nothing but wild cards, which meant he was unable to establish any decent wall colours. In the end, Mark K ran out as winner, having been able to claim two good sets of walls in the first scoring round. Although Nige got a massive stack of blue cards in the second scoring, it was never going to be enough to overtake Mark. This site got hacked earlier in the week and it took me a while to get rid of the forwarding link that was inserted somewhere into my database. Thanks eventually to my web host, Web Mania, we managed to track it down and remove it. I think everything’s back working normally again now but, if anyone sees anything strange, let me know. And apologies to anyone who tried to access the site and got re-directed to the hacker’s site. Hopefully, it won’t happen again.